A Place for Nature to Thrive. 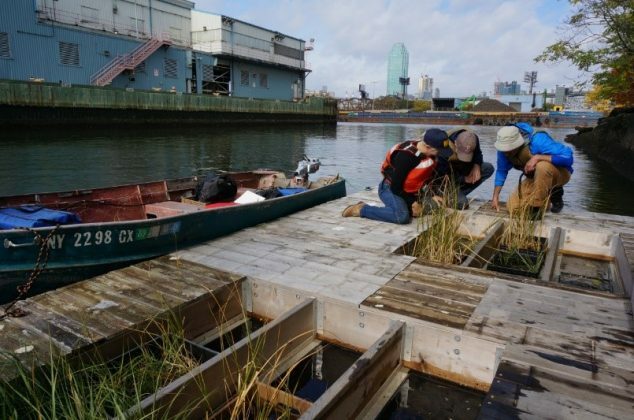 Newtown Creek has great potential to utilize native species of plants and animals to help clean the fouled waters. Marine plant life and bivalves like mussels, oysters and clams can help filter the water of excessive nutrients and bacteria. Yet many of these crucial species have limited places to grow. To offer clean habitats for native species we have incorporated various salt marsh plant species and substrates. Ropes and stone provide more protection for killifish and shrimp while other materials, like oyster and clam shells, encourage barnacles, mussels and slipper snails. The dock can host visitors to get a first hand look at the habitat units and numerous species that have been returning to Newtown Creek. NCA partners with the North Brooklyn Boat Club to bring folks to the dock via canoe. For more information on seeing the dock in person, contact program manager Willis Elkins – welkins (at) newtowncreekalliance (dot) org. The dock utilizes a number of repurposed items such as reclaimed cedar (used for decking and structural support); 30 gallon food barrels (used for flotation) and plastic milk crates (used as uniform habitat units). All work to date has been documented on the project’s website: http://livingdock.tumblr.com/. The website provides a way for a larger community to learn from the dock without visiting the structure. Additionally, NCA has created a small booklet to document the design and construction of the dock; it can be viewed here. The Living Dock project was made possible with funding provided by the New York State Office of the Attorney General and the New York State Department of Environmental Conservation through the Greenpoint Community Environmental Fund.